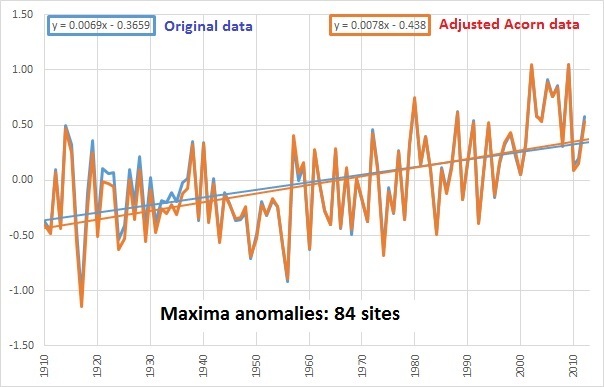 The effect of adjustments made to create the official Australian temperature record is an increase in warming trend of 66.6% for minima, and 13% for maxima. Given that minimum temperatures are particularly sensitive to Urban Heat Island (UHI) effects and also enhanced greenhouse warming (where greater night time than day time warming can be attributed to higher concentrations of greenhouse gases), this result is extraordinary. Any analysis of UHI or greenhouse warming signal is rendered impossible as the true signal is distorted by the adjustments. Four years ago in 2010 I posted my analysis of Australia’s so-called High Quality (HQ) temperature dataset. This was a temperature record which the highest officers of the Bureau of Meteorology (BOM) assured me had adjustments that were on average neutral across the whole network. My analysis of the mean HQ temperatures compared with the data available at Climate Data Online showed a warming bias of over 40%. HQ was quietly abandoned with the introduction with some fanfare in March 2012 of the Australian Climate Observations Reference Network- Surface Air Temperatures (ACORN-SAT or Acorn). This is a homogenised dataset based on daily temperatures, from 112 observing stations around Australia. 104 of these are used for climate analysis, being non-urban. Acorn data is readily available as daily, monthly, and annual data. The 8 yellow dots are locations dubbed “urban” and are not used in temperature analyses. These stations are: Townsville, Rockhampton, Sydney, Richmond NSW, Melbourne, Laverton RAAF, Adelaide, Hobart. The median position of all 104 Acorn stations is about 200km north-east of Broken Hill in NSW. I studied a sample of 10 Acorn sites in May 2012, which convinced me that the Acorn dataset has many defects. However, I have now decided to study the whole network, comparing Acorn data with the station data from which it is derived, to discover whether the approximate balance between positive and negative adjustments has any influence on long term trends of the original data. I did not concern myself with the individual adjustments themselves, but with the effect these adjustments have had on the temperature record. 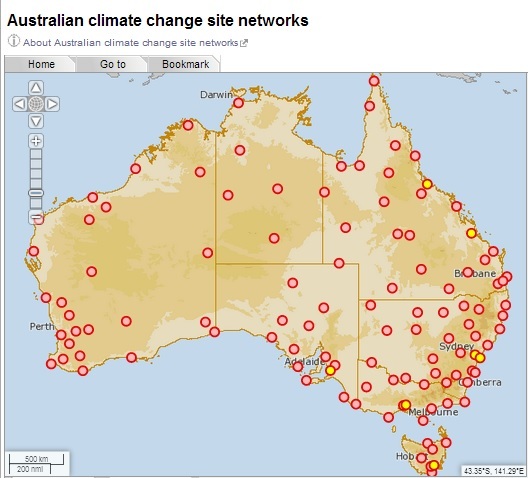 I downloaded annual minima and maxima data for each Acorn site from Site Networks at the BOM’s Climate Change page, and also downloaded corresponding data for the same and preceding sites from Climate Data Online (CDO). I am therefore comparing the effect on trends of publicly available data from two sections of the BOM website. When an observing station closes and is superseded by a new station, the two temperature series may be combined or spliced to form a continuous series that is in theory homogeneous- that is, the series shows a smooth transition with no discontinuities or spurious jumps or drops from the old to the new. The previous data, all else being equal, may be compared with the later data, and temperature trends derived. I do this only for stations with at least 24 months of overlap and no more than 30km apart, by adjusting previous data up or down by the mean difference from the new data for from 24 months to the first five years during the overlap period. The Acorn series are constructed from sites sometimes with much less than 24 months, and sometimes no overlap, and occasionally by combining records many kilometres apart, by comparing with up to 40 sites to detect discontinuities, and up to 10 sites to adjust the record. (See CAWCR Technical Report No. 049 for full details.) A check on the validity of my adjustment for station change was the difference between my values and those of Acorn for the same period at ransition. In all but a couple of cases, my values matched identically, or occasionally with a difference of +/- 0.1 degree. Instances of mismatch were due to additional homogenisation by Acorn after or during the transition not related to the overlap adjustment. I made no other adjustments. Because of this major difference caused by my conservative decision not to combine records with less than 24 months of overlap, I was unable to compare trends at a number of sites. Further, at several sites, Acorn shows data for many years for which there is no corresponding CDO data, so comparison was not possible. Of the 104 possible sites, I compared temperature trends for 83 minima sites and 84 maxima sites. Another complication was different length series, in particular different start and end points. To ensure trends were accurately compared, I removed up to three additional years at the start to ensure both Acorn and minimally adjusted series had the same start date. As well, Acorn displays annual data for 2013 for nearly all stations, even though CDO data has not yet been quality assured and therefore not published. I removed all 2013 Acorn data unless CDO also provides it. Doing this decreases the warming in Acorn, making it closer to the ‘raw’ warming. I did not remove intermediate data that did not match. For example, Acorn removes several spurious annual means in the 1930s for Palmerville (Qld) which remain in CDO- the effect is slightly less warming in Acorn than CDO. My object was to compare Acorn with minimally adjusted data for the same length of period, so intermediate data adjustments, replacements, and deletions, are relevant. 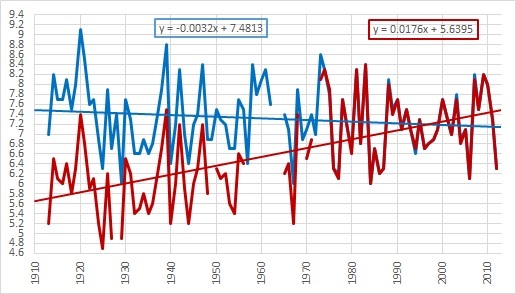 For each Acorn site for which comparison could be made, I calculated trend in degrees Celsius per 100 years for Acorn and ‘raw’ data (CDO data, only adjusted for overlapping data) for the period 1910 to 2013. I also calculated annual anomalies from 1961 -1990 means for each site, and calculated annual means for the whole network from these. Mean of the trends of the ‘raw’ data at the 83 minima sites was +0.82 degree Celsius per 100 years. 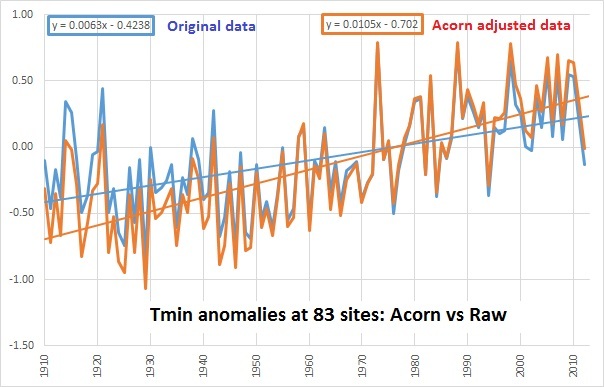 The Acorn mean trend was +1.18 C.
The mean difference in trends (Acorn minus raw) of the 83 minima sites was +0.37 degree Celsius. That is a 44.8 % warming bias. 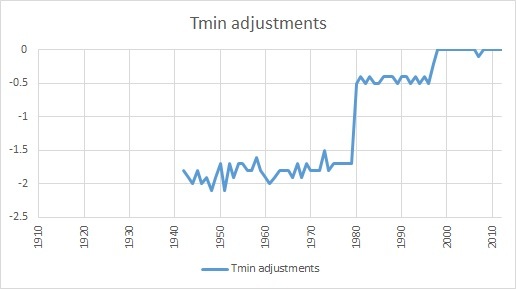 Figure 2 shows the range in the difference in trend caused by Acorn adjustments (from greatest cooling to greatest warming) across the 83 sites I was able to compare. However, the practical effect of the Acorn adjustments is on the long term annual temperature trend. 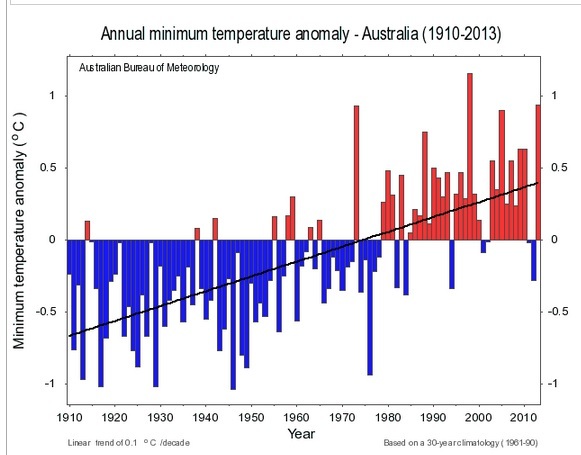 Here is BOM’s official graph of minimum temperatures (calculated as anomalies) 1910 – 2013, based on 104 Acorn sites. BOM calculates a trend of +0.1C per decade (or 1 degree per 100 years). Figure 4 shows my plot of annual mean minima for the same period (calculated as a straight average- the BOM graph is area averaged) for 83 sites ‘raw’ compared with Acorn. Note: the ‘raw’ trend is +0.63C per 100 years. The adjusted trend is +1.05C. The difference of +0.42C represents an increase of 66.6 %. Figure 5 is a plot of the annual average difference in temperatures. 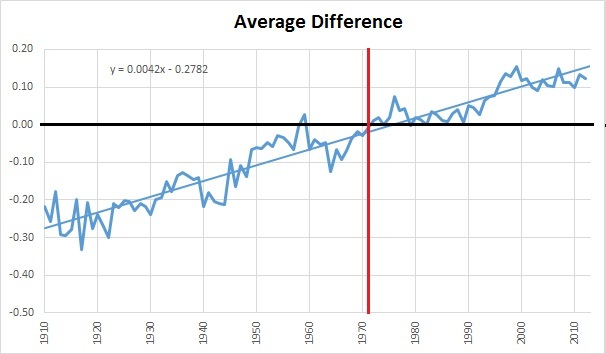 Note there is only one year (1959) before 1971 that has on average greater positive adjustments, and there are no years after 1971 of average adjustments below zero. In other words, the record before 1971 is cooled and after 1971 is warmed. Is my comparison robust? 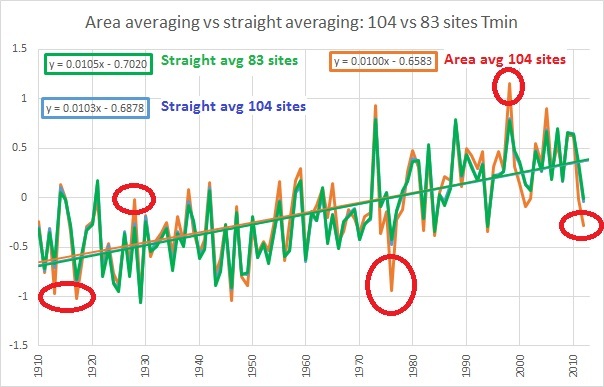 In particular, how do trend values calculated from a straight mean of annual data for 83 sites compare with those for 104 sites, and how does a straight mean compare with area averaged data? Figure 6 is a comparison of the straight average of Acorn data at my 83 sites, with my calculation of the straight average of official Acorn minima for the whole 104 sites (excluding 2013), and the official area averaged data for 104 sites. The comparison is made clearer by plotting the difference between straight averaged 104 and 83 site series, and the difference between area averaged and straight averaged 104 site series. Note that area averaging appears to increase extremes, but the trend is almost the same. 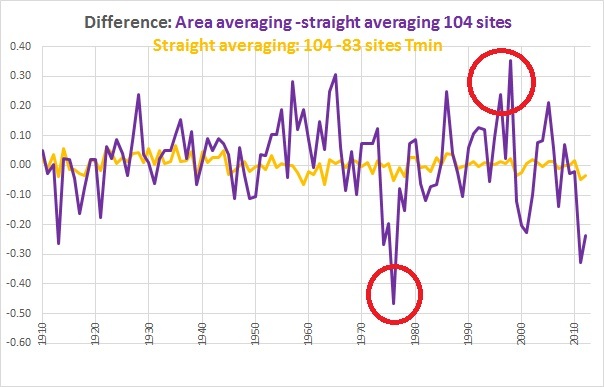 The straight average trend of 104 sites is +1.03C per 100 years, almost identical to that of the 83 sites. Therefore, my comparison is valid, and area averaging which decreases the trend in Acorn by 0.03C to +1 C should apply proportionately to the ‘raw’ trend for exactly the same sites. If the mean is calculated as (Tmin + Tmax) / 2, then unless maxima are massively cooled, the result will be a significant increase in the mean trend. Acorn adjustments have increased the maxima warming trend by +0.09C, or 13 %. Therefore, the minima adjustments are not balanced by the maxima, and mean temperatures are also artificially warmed. While the number of positive and negative adjustments made by the creators of Acorn may be balanced or nearly so, their effect on the minimum temperature record is enormous. Analysis of a not insignificant sample of 83 of 104 Acorn sites shows a warming bias in adjustments to minima of 45 %, which has the effect of increasing the network-wide temperature trend by 66.6 %. The adjustments have predominantly cooled pre-1971 temperatures and warmed post-1971 temperatures. For maxima, the increase in trend is 13 %. This result casts doubt on the veracity of the Acorn temperature record, and its usefulness for climate analysis. Please note: I make no judgement about the justification or lack of it for the individual adjustments. 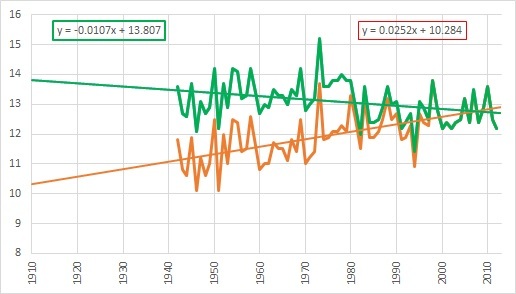 Nor am I claiming that my calculation of +0.63C per 100 years is the true trend in minima for Australia. Far from it: that figure is based on only 83 stations, not evenly distributed, many of which have much less than 100 years of data and/or many years of missing data. I’m saying no one knows for sure, but that the adjustments to the ‘raw’ data at CDO, in order to create the Acorn dataset, result in a massive and unexplained difference. I welcome any comments or arguments that can show how I may remove errors from this finding, or how I may improve my analysis. Eddystone Point, Mt Gambier, Port Lincoln, Tarcoola, Marree, Darwin, Tennant Creek, Eucla, Forrest, Meekatharra, Port Hedland, Horn Island, Weipa, Normanton, Charters Towers, Bundaberg, St. George, Bourke, Nowra, Walgett, Moree. Mt Gambier is included in maxima comparison only. 2. Some readers have expressed interest in Rutherglen, Victoria. Here is the comparison for Rutherglen. 3. ‘Raw’ data is not raw. Data at Climate Data Online is as close as we are likely to get, but has been observed, scribbled down, transcribed to monthly reporting sheets/ registers, transmitted, quality assured, converted from Fahrenheit to Celsius (pre-1972 data), and digitised. Much can go wrong. You are currently browsing the kenskingdom blog archives for May, 2014.